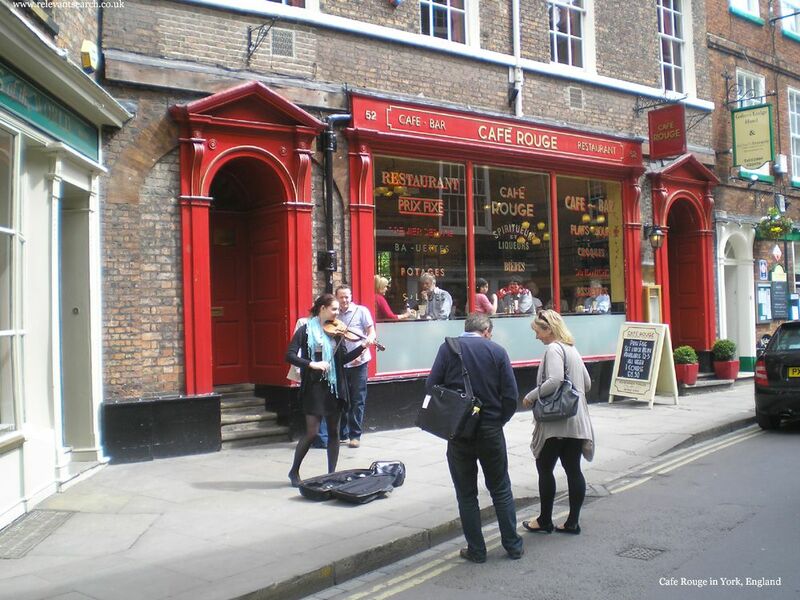 Below is a list of York Restaurants in England with Phone Numbers, Websites, Images and links to Maps and Reviews. Click on Post-Codes for Reviews, Maps and Offers may be available. 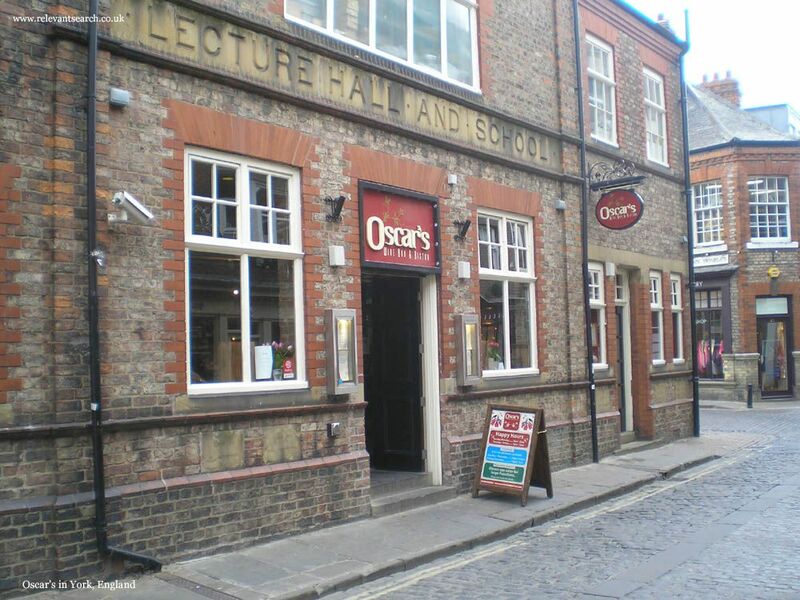 Oscar's has been a popular York restaurant since the early 80's, offering a warm and friendly service in a cosy, stylish premises. Situated in York Centre on Swinegate. Tel: 01904 652 002.
www.biltmoreandoscars.co.uk . Postcode: YO1 8AZ. Serving a varied range of lunch and snacks in the main dining room through the day, and transformed into an elegant candlelit restaurant in the evening. Situated in York Centre on Castlegate by York Castle/Cliffords Tower. Tel: 01904 621 404.
www.31castlegate.co.uk . Postcode: YO1 9RN. Award winning food in a relaxed atmosphere known for fresh fish dishes, home made desserts and a great selection of fine wines. Situated in York centre on Fossgate. Tel: 01904 673 990.
www.thebluebicycle.com . Postcode: YO1 9TA. 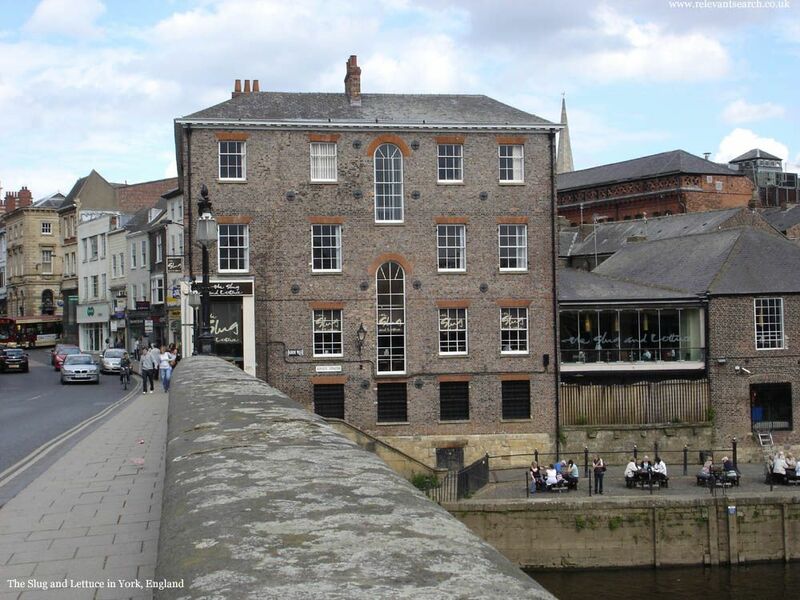 Gert & Henry's Restaurant is situated at York market, in one of the most historic buildings in the city. Good food for a very reasonable price. Tel: 01904 621 445. Award winning restaurant close to York Minster & The Shambles on Goodramgate. Great food served in a relaxed and friendly atmosphere. Tel: 01904 632 734.
limehouserestaurant-york.co.uk . Postcode: YO1 7LS. We offer an extensive selection of fresh and seasonal dishes on our à la carte menu. Situated in York centre on Walmgate. Tel: 01904 650 910.
lochfyneseafoodandgrill.co.uk . Postcode: YO1 9TJ. 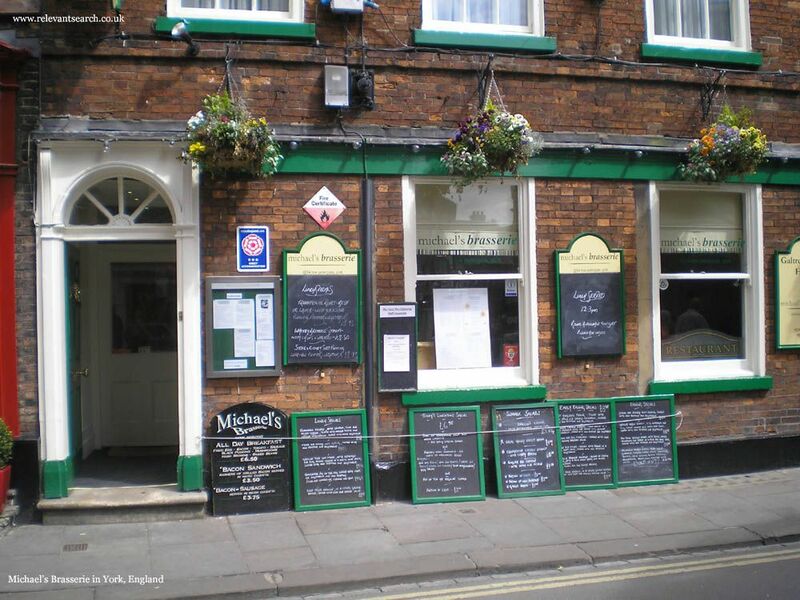 Melton's can be found in all major food guides, cooking innovative food with local produce. Situated in York centre on Scarcroft Road. Tel 01904 634 341.
meltonsrestaurant.co.uk . Postcode: YO23 1ND. We specialise in English and Continental dishes, served in a modern, bright atmosphere. Situated in York centre on Low Petergate. Tel 01904 622 478. Table 9 has views along Swinegate, one of the most sought after tables in York. Modern British food with a European twist. Situated in York centre on Grape Lane. 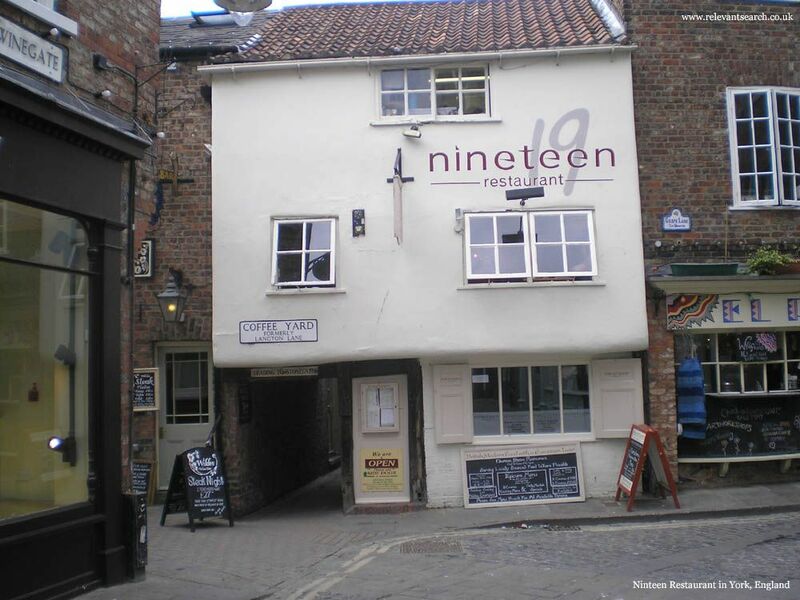 Tel: 01904 636 366.
www.nineteenyork.com . Postcode: YO1 7HU. 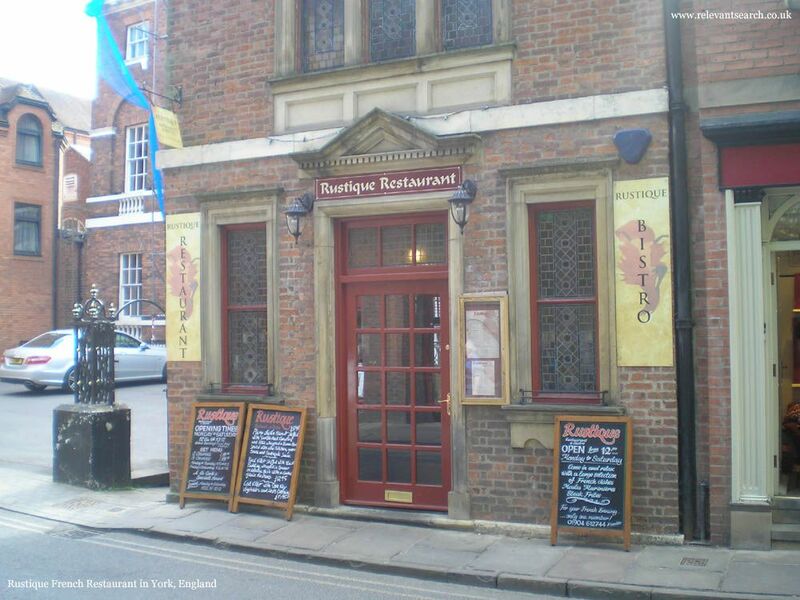 A cosy, intimate and friendly dining experience in a traditional old York building. Situated in York centre on High Petergate. Tel: 01904 637 722.
www.plunkets.co.uk . Postcode: YO1 7EN. A bar/restaurant in the centre of York that serves breakfast, lunch and dinner. Situated in York centre on Low Ousegate. Tel: 01904 639 971.
www.slugandlettuce.co.uk . Postcode: YO1 9QU. 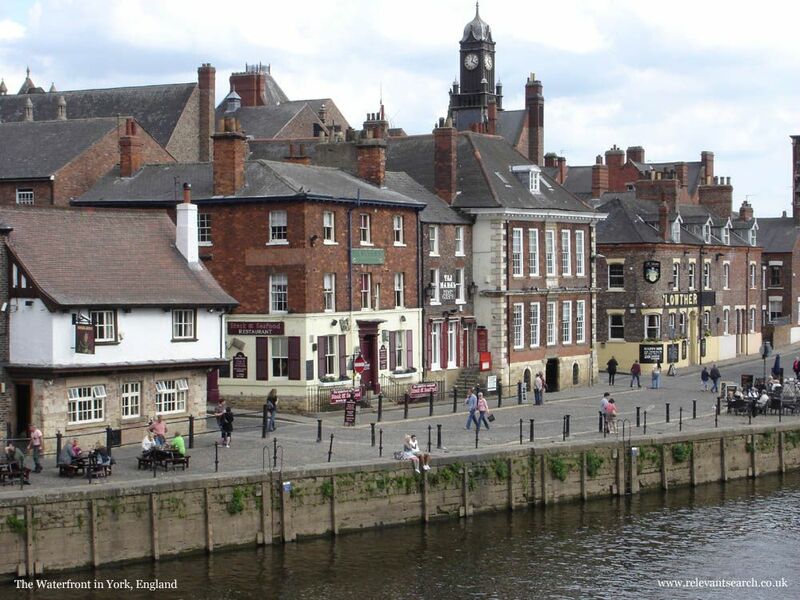 An independent restaurant, situated on King's Staith on the banks of the River Ouse, serving a range of fish, mostly sourced locally, and a wide variety of steak dishes. Tel: 01904 671 108.
thewaterfronthotelyork.co.uk . Postcode: YO1 9SN. 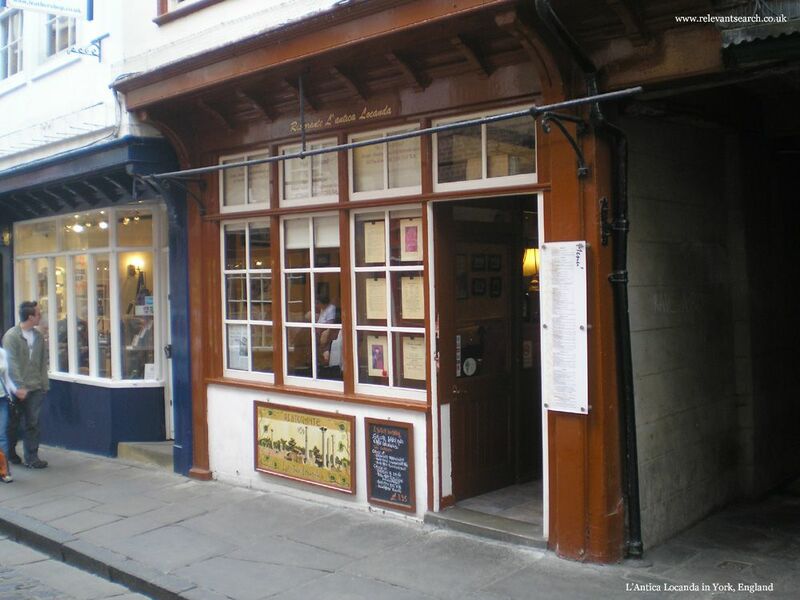 A well known French Restaurant and Cafe-Bar close to York Minister Cathedral. Situated in York Centre on Low Petergate. Tel: 01904 673 293.
www.caferouge.co.uk . Postcode: YO1 7HZ. Rustic French cooking in a busy, vibrant Bistro atmosphere, with a wde selection of meat and fish dishes. Situated in York Centre on Castlegate. Tel: 01904 612 744 .
www.rustiquerestaurants.co.uk . Postcode: YO1 9RP. 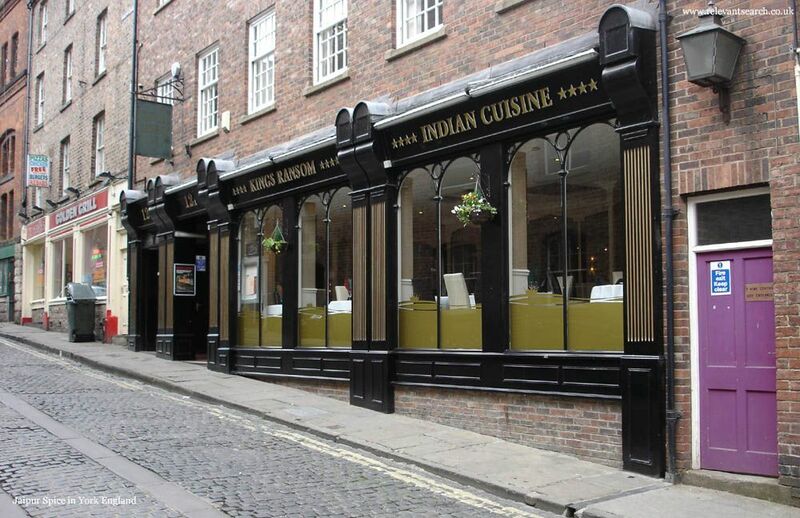 One of York's longest established Indian Restaurants, popular with visitors and locals. Situated in York Centre on North Street. Tel: 01904 633 550. A traditional Indian / Bengali restaurant serving traditional curry or something a little more adventurous. Situated in York Centre on Goodramgate. 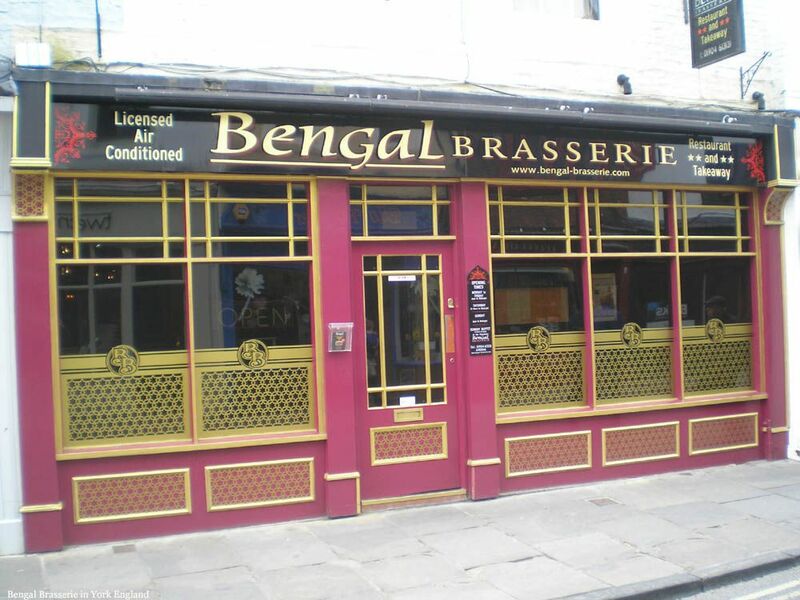 Tel: 01904 640 066.
www.bengal-brasserie.com . Postcode: YO1 2LW. An Indian restaurant known for fine classic cooking, traditional surroundings and friendly staff. Situated in York Centre on King Street. Tel: 01904 632 886.
www.masalacraftyork.com . Postcode: YO1 9WP. 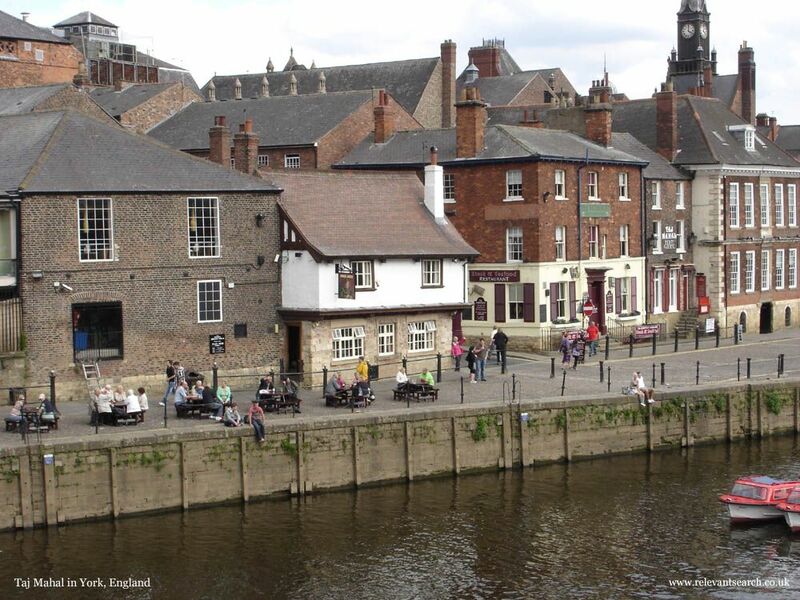 An Indian restaurant overlooking the river Ouse with a fantastic menu and variety of dishes. Situated in York Centre on Kings Staith. Tel: 01904 653 944. Serving a family friendly menu of pizzas, pastas, salads and meat and fish mains. Situated in York centre on Low Petergate. Tel: 01904 611 221. Offering quality food freshly prepared, ideal for that romantic meal for two, a special occasion, or family treats. Situated in the centre of York on Goodgramgate. Tel: 01904 670 914.
caesars-restaurants.co.uk . Postcode: YO1 7LS. Situated on one of the famous medieval streets, an ideal place for a romantic dinner. Situated in the centre of York on the street named Shambles. Tel: 01904 670 247.
www.lantica-locanda.co.uk . Postcode: YO1 7LX. Enjoy a relaxing Italian meal in York in our spacious Italian restaurant, close to the York Minster and many of the city centre shops. Situated in the centre of York on Goodramgate. Tel: 01904 642 641.
www.lapiazzayork.co.uk . Postcode: YO1 7LS. 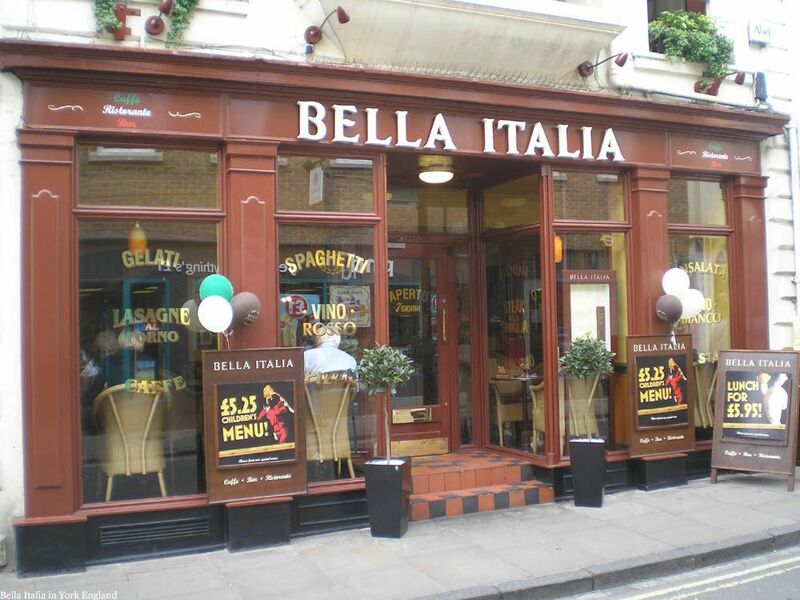 A traditional Italian Restaurant serving good value specials. 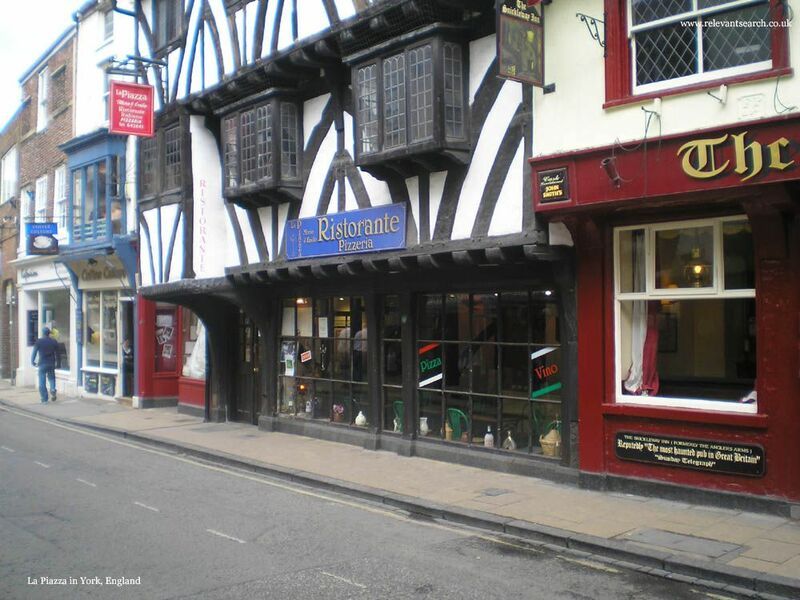 Situated in the centre of York on the street named Shambles. Tel: 01904 633 807. An Italian restaurants offering chic yet informal dining, bringing a true taste of Italy to the customers. Situated in the centre of York on Bridge Street. Tel: 01904 521 155.
piccolinorestaurants.co.uk . Postcode: YO1 6DA. A relaxing, friendly atmosphere with a laidback, yet professional service. Situated in York centre on High Ousegate. Tel: 01904 644 080.
www.ateoclock.co.uk . Postcode: YO1 8RZ. A 150 seat restaurantwith an extensive menu and a large wine list. Many great deals for groups and parties. Situated in York centre on Grape Lane. Tel: 01904 610 676.
www.el-piano.com . Postcode: YO1 7HU. A Superb Spanish menue, from noon until late, each day. Set over two floors, with a roof terrace for al fresco dining, the perfect spot to enjoy great tapas and other Spanish specialities. Situated in York centre on Back Swinegate. 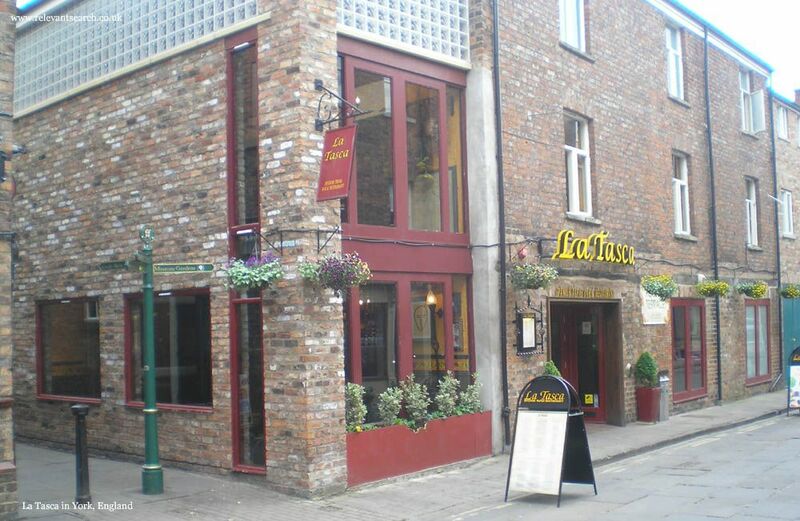 Tel: 01904 521 100.
latasca.com/venue/york/ . Postcode: YO1 8AD.